Trunks: Trunks erect, 1 to 2 feet in diameter; usually low-branching; crown rounded or irregular; bark reddish brown to gray, deeply furrowed. Twigs: Slender, rigid, gray or reddish-brown, often zigzag, with pairs of short, stout spines at nodes; leaf scars triangular. Leaves: Alternate, stalked, odd-pinnately compound, 4 to 10 inches long; leaflets 7-27, elliptic to oblong-ovate, 3/4 to 2 inches long, 1/2 to 1 inch wide, bluish green above, paler green below, nearly glabrous; margins entire; tips rounded. Flowers: Showy, fragrant, short-stalked; calyces bell-shaped, 5-toothed, finely hairy; corollas papilionaceous, white; banner 1/2 to 1 inch long, erect or bent backward, greenish yellow patch at base; stamens 10. Fruit: Pods, 2 to 4 inches long, about 1/2 inch wide, straight, smooth, flat, brown, persist through winter; seeds 3-12, kidney-shaped, hard, dark-brown. Habitat: Dry or moist roadsides, open woods, shelterbelts, pastures, thickets, and stream valleys. Comments: Often planted by early settlers and escaped into the wild. The leaflets fold together at night. 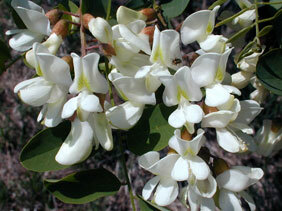 Black locust is drought tolerant but susceptible to insect borers and fungal diseases. Its wood is hard and durable. Robina honors Jean Robin, 1550-1629, French botanist.